HCM City (VNA) – Chairman of the People’s Committee of Ho Chi Minh City Nguyen Thanh Phong has pledged to boost cooperation with Mozambique in justice, trade, investment, agriculture and education. During his reception for visiting Mozambican Attorney-General Beatriz Buchili on August 23, Phong lauded the recently signed memorandum of understanding between the Supreme People’s Procuracy of Vietnam and the Mozambican Attorney General’s Office, saying that it lays a legal foundation for the People’s Procuracy of HCM City to boost cooperation with judicial agencies of Mozambican localities. 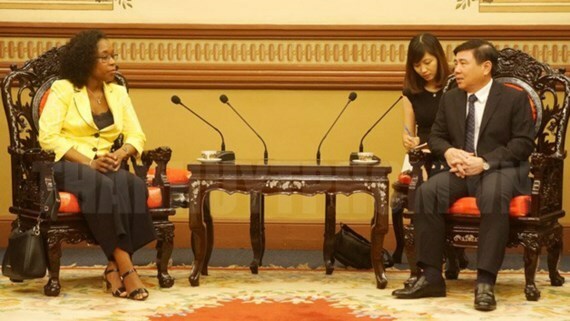 He expressed his hope that Mozambique will continue facilitating Vietnamese firms’ operation in the country. The municipal leader forwarded to the related agencies for consideration the suggestion to establish the Honorary Consulate of Mozambique in Ho Chi Minh City made by the Mozambican Attorney-General and the Embassy of Mozambique in Vietnam. For her part, Beatriz Buchili expressed her admiration for the dynamic development of the city, expressing her hope that local authorities will support cooperation between the municipal People’s Procuracy and the judicial agencies of Mozambican localities.